Over the past hundred years, anniversaries of the artist’s birth and death have usually provided the occasions for monographic exhibitions. In the exhibitions presented between 1908 and 2007 in Vorarlberg and – in 1941 – in her birthplace Chur (Switzerland), the selection of works was limited for the most part to collections in the region of Vorarlberg and in Switzerland. In 1955 tribute was also paid to Kauffman in England with an initial monographic exhibition of works of English provenance, presented at Kenwood House. Kauffman’s work was first shown alongside works by her contemporaries in an exhibition presented in Bregenz and Vienna in 1968. With altogether approximately three hundred works the Düsseldorf retrospective of 1998-1999 with further venues in Munich and Chur provided the largest survey of the artist’s paintings, drawings, prints and engraved copies ever presented until that time. Likewise in 1998, a selection of 50 paintings, 28 drawings and 31 engraved copies was presented in Rome; the works by Kauffman’s contemporaries remained in the permanent collection, marked with labels. 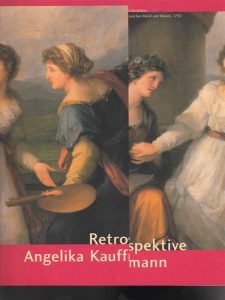 On this subject, see exhibition review: Bettina Baumgärtel: “Angelika Kauffmann – Echt oder Falsch? Eine Auswahl von Kopien, Fälschungen und Falschzuschreibungen”, in: Weltkunst, vol. 68, no. 13, Munich, 1998, pp. 2410-14 [PDF-File]. In 2005, the first exhibition of works by Kauffman, primarily from the holdings of the museum in Chur, took place in Estonia.